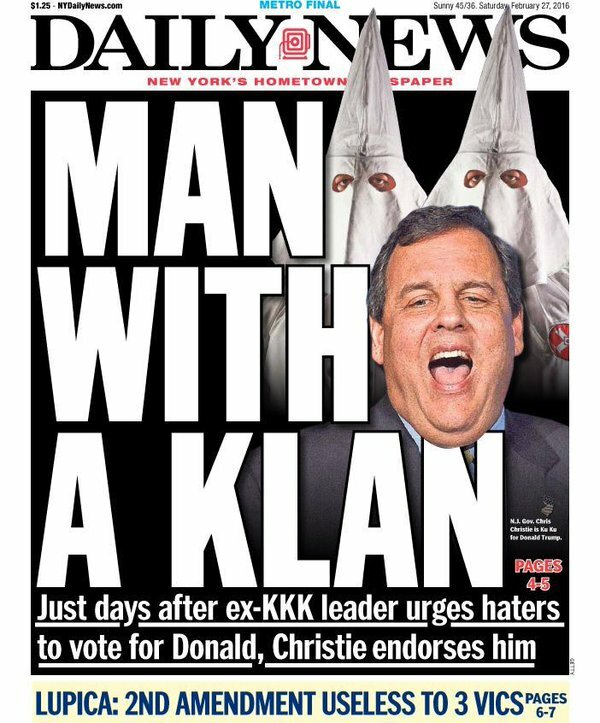 In February, Governor Christie's endorsement of wacko racist Donald J. Trump for president prompted seven major New Jersey dailies to call for his resignation. The Record of Woodland Park was the exception. Editor Deirdre Sykes of The Record continues to sanitize Governor Christie's record, especially when it comes to his 500-plus vetoes -- many aimed at bills helping the middle and working classes. On Saturday's front page, Staff Writer John C. Ensslin reports Christie has "several more weeks to mull over" three dozen pending bills, including one that would raise the minimum wage to $10.10 an hour. Of course, Ensslin and Sykes know the fate of this latest proposal will be the same as the hike he killed in 2013, but nowhere in the story do they report that veto. On the continuation page, Ensslin notes "Democratic lawmakers fully expect Christie will veto ... the bill raising the minimum wage from $8.38 to $10.10 per hour with additional hikes of at least $1 until it reaches $15 by 2021." If Christie vetoes the bill, the issue won't go on the ballot until November 2017. After the GOP bully vetoed the earlier proposal, voters OK'd a hike in the minimum wage in November 2013. Even hard-core baseball fans think The Record overdid the coverage of Yankee Alex Rodriguez's last game on Friday. Sykes ran two columns and two news stories about A-Rod on Saturday (Page 1 and the Sports front). "The human lightning rod getting interrupted by the real thing." "A-Rod" is a creation of tabloid headline writers who never had the room to write "Rodriguez." Saturday's local-news section was filled with news from Paterson (L-1, L-2, L-3 and L-6). But the local editors must have the missed the exit to Hackensack. A photo of a man carrying bottled water up the stairs to his Hackensack apartment is all the news city residents got (L-6). Today's Local section is completely missing Hackensack news. Transportation writer John Cichowski had to figure out some way to justify a column on traumatic brain injuries from falls so he compares the number of deaths to "being killed on foot in traffic" (Road Warrior on L-1). Today's front page carries a moving account of veterans who smoke marijuana to find relief from the haunting images of war and death (A-1). The story by Staff Writer Todd South, himself a veteran, comes two days after the federal government's decision to withhold the approval of marijuana for medical purposes. Officials said there is no scientific evidence it works.